As a child growing up in Greece, Tom Lakiotis’ parents taught him that it is better to give than to receive and instilled a love of volunteering in their son. For the past 15 years, Tom has volunteered his talents as a photographer, chef and chaperone for the music department at Gregory Middle School, where he is being recognized as the District 204 BMO Harris Bank Volunteer of the Month. When his children were in the orchestra, Tom often volunteered to serve as a chaperone on field trips. Although his three children have all graduated, he continues to volunteer every year to take all the music department yearbook photographs. He attends the band, orchestra and chorus concerts to capture photographs of the students performing. The yearbook has a beautiful section each year devoted to the music department that features his photography. Every few years, Gregory Middle School hosts a large music festival. Several years ago, Tom offered to cook for all the judges and all the teachers who attended the event. Today, he not only continues to cook for about 100 judges at Gregory, but he also provides meals for music festivals at Crone, Hill and Granger Middle Schools. Tom has always encouraged parents to get involved in their children’s schools. “It allows you to keep a pulse on what’s happening with their education as well as their personal development,” he said. As a lifelong learner who went back to school to become a certified teacher, Tom has been invited into the classroom to present on Ancient Greek and Roman Histories and first-person accounts on the geography and the peoples around the Mediterranean Sea. He was a substitute teacher at Gregory, and recently learned to drive a school bus and has a regular route in the district. 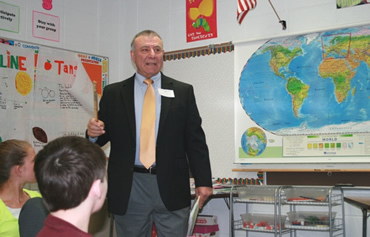 Volunteer Tom Lakiotis has been invited into the classroom to present on Ancient Greek and Roman history.